Sharks always spark up ridiculous buzz in the TV ratings and it’s not hard to see why: the pulsing predator-ness, the mean-eyed, sharp-toothed look of them. 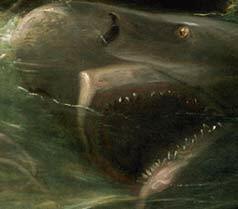 They’ve long conjured up awe and fear in equal measure, which is why, even though it’s not shark season anymore, I’m going to share this amazing painting. 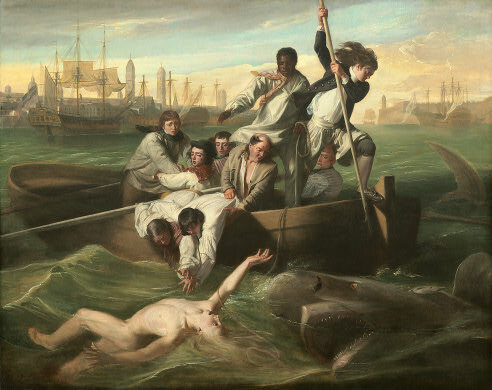 It’s called Watson and the Shark (1778) and is by an artist called John Singleton Copley (1738 – 1815). This man was regarded as colonial America’s greatest painter, which is impressive given the fact he was largely self-taught. By the 1760s Copley had established himself as the colonies’ leading portrait painter, making a small fortune and mingling with affluent society. But what we’re looking at today is not a portrait, no sir. 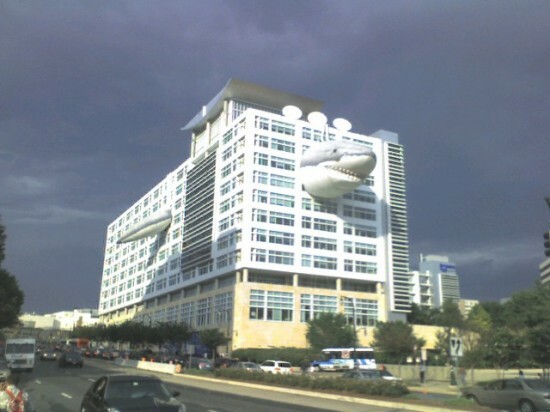 Watson and the Shark is a depiction of an event that took place in Cuba in 1749: a 14-year-old boy called Brook Watson was swimming in the Havana Harbor when he was attacked by a shark. The animal came back repeatedly, first stripping the flesh off Watson’s right leg below the calf, the second time biting off the boy’s right foot. When this painting showed in the 1778 exhibition at the Royal Academy in London (Copley had settled in England in 1775), it stunned spectators, who’d never seen anything so grisly before. And yet, the use of blood is modest at most (just some traces of it in the water and on the shark’s mouth) and the picture stops and crops at the exact place where Watson’s lost foot would have been. In limiting the guts and the gore, Copley spares his swooning lady spectators, and (after all) he did have to ensure that this would not be censored. Just imagine though how he might have re-painted this, were it for an audience now. What is utterly gripping about this painting is the way the artist adds cut and thrust to a still image. We read a sense of the forward movement of the boat (into the body of the shark), and there’s the emphatic diagonal of the main rescuer’s spear as he attempts to jab away the attacker. There’s the mighty, meaty sweep of the shark from back right to front right (so colossal is the beast, we’re seeing just its head and tail), and the dipping downward triangle formed by the two men leaning over the boat. Worst is pale, thrashing Watson in the water: the moment is frozen and we’re left to imagine his fate. Incredibly, he was snatched from the jaws of death and went on to become a successful merchant and politician in England. Wonder if he ever considered appearing in a special on how to survive a vicious shark attack.